Back in October I showed you this photo of the HallowWishes fireworks show with perimeter bursts from inside the Magic Kingdom at Walt Disney World. 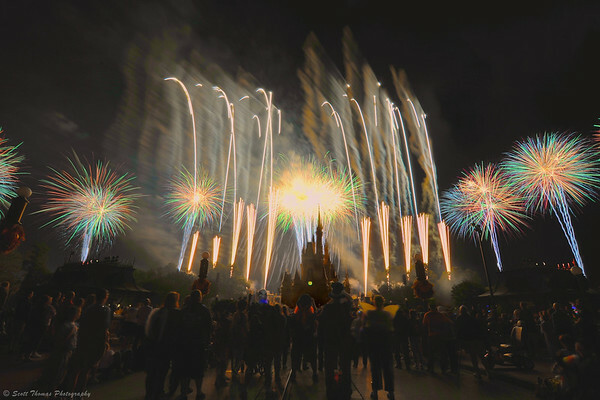 HalloWishes finale featuring perimeter fireworks in the Magic Kingdom. Nikon D700/Tokina 11-16mm, 7.5s, f/11, ISO 200, EV 0, 16mm focal length, 3 Stop (0.9) ND filter, tripod. I used a wide angle lens here so the fireworks do not look as close as they do when you are standing there. In fact, the fireworks look like they are on top of you. Last week, I photographed Holiday Wishes which also features perimeter bursts. This time I photographed the show from across the Seven Seas Lagoon at the Ticket and Transportation Center (TTC). I and a couple of other photographers set up our tripods near the Ferryboat dock. I had studied the show from youTube videos so I knew the first perimeter bursts would happen a minute into the show and after eleven minutes. When the show started, the music was put on the speakers in the area. I did not expect that and was pleasantly surprised. Here is what the perimeter bursts look like from this location. Holiday Wishes from the Ticket and Transportation Center (TTC) at Walt Disney World. Nikon D700/28-300VR, 6.4s, f/22, ISO 200, EV -1.0, 36mm focal length, 0.9 ND filter, tripod. The bursts which look so close when inside the park are not very close at all. Disney is a master of what is called forced perspective. They use it in the architecture of the parks and, as you can see, in their firework shows, too. 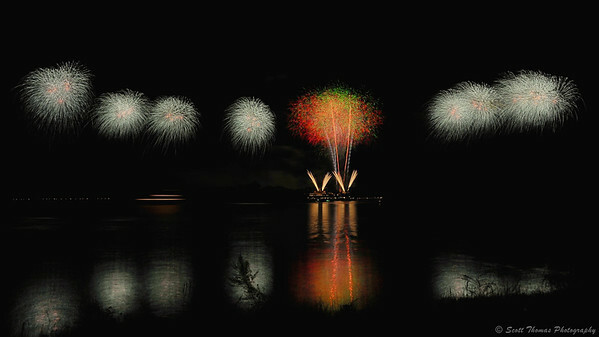 This entry was posted in Photography and tagged 28-300mm, filter, fireworks, florida, forced perspective, holiday wishes, long exposure, magic kingdom, neutral density, night, nikon D700, orlando, reflection, seven seas lagoon, tripod, vr, walt disney world, water. Bookmark the permalink. Wonderful images Scott. I love fireworks. So does Disney. They have a fireworks show over the castle every night. Those Disney people certainly know what they’re doing! I have seen this show inside the park so this perspective was interesting to see. The scope of the perimeter bursts was much greater then I expected. I really like that second photo of yours Scott. It kind of makes me wonder how it might have turned using a panoramic camera. Yeah, I should have looked for a cheap disposable pano camera to use during the long exposures. I formatted it 16 by 9 to give it psuedo-pano effect. Incredible fireworks! I love the first one especially. I am also–terribly–regretting not participating in your multi-season photography assignment. I am so impressed with the way the scenes look so different in different seasons. It kind of reminds me of the original posters for Close Encounters of the Third Kind. Thanks, Preston, high praise coming from you! Beautiful fireworks! I wish you and your family a Happy Christmas. Scott, it’s an awesome shot. The two images really put things into perspective for me. Thanks, Derrick! Happy to meet another Texan! Nice blog!